Mid-way through last year, the Queen’s Hotel in Fort Macleod was added to the Alberta Register of Historic Places. The Queen’s Hotel was designated as a Provincial Historic Resource on May 22, 2012. The building was deemed to possess heritage significance as it is an excellent example of the type of substantial hotels built in Alberta’s urban centres during boom periods of the late 1800s and early 1900s. The hotel also contributes to the heritage character of the Fort Macleod Provincial Historic Area. Fort Macleod was one of Alberta’s earliest and most important urban centres during the settlement period. 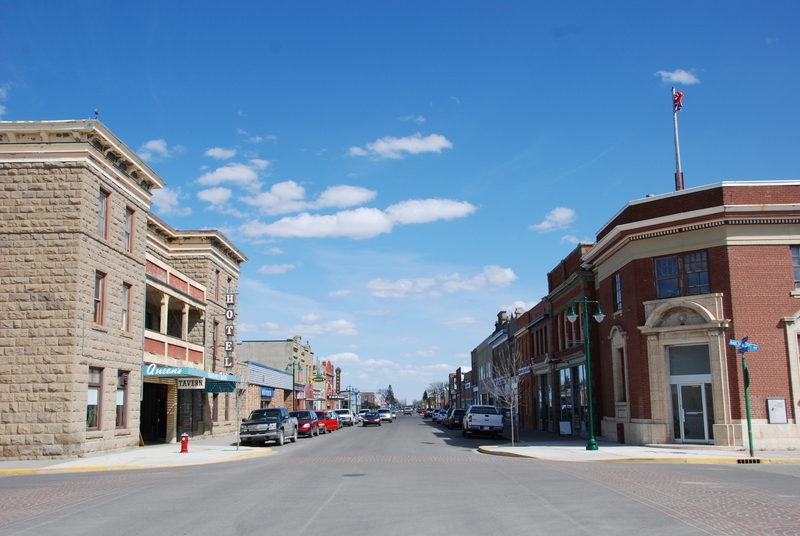 As a thriving commercial hub and service centre for the surrounding ranching and farming communities, a number of buildings were constructed in the town’s downtown area. Locally-quarried sandstone became the building material of choice, largely due to its fire-proofing properties and the sense of stability and permanence it lent to the business and town. 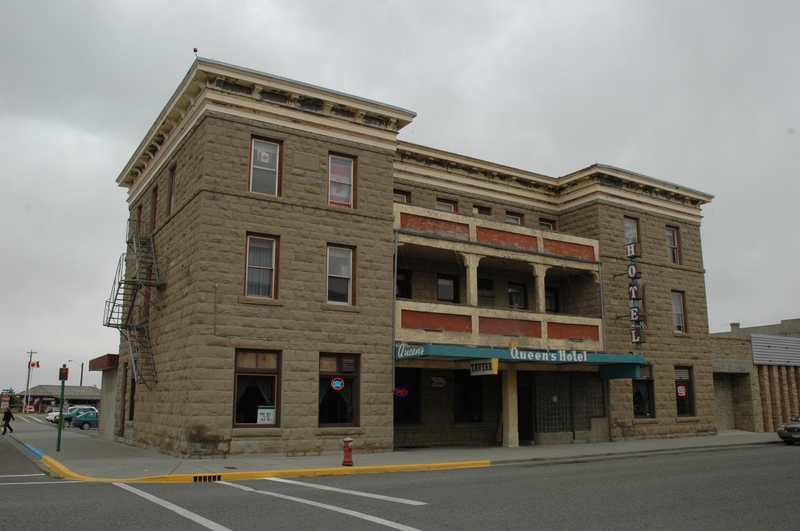 The Queen’s Hotel was one of the first buildings in Fort Macleod to be built of sandstone. It was built in 1903 to replace an earlier, smaller, wood-frame hotel of the same name. The hotel is a three-storey, flat-roofed building with a U-shaped footprint. It is a prominent building in downtown Fort Macleod, being located on the northeast corner of 24th Street and Second Avenue in the town’s main commercial district. It is constructed of rough-faced sandstone blocks and is crowned by a substantial, pressed metal cornice. On completion, the Queen’s Hotel was touted as Fort Macleod’s finest lodgings and it was the most expensive accommodations in town. The Queen’s Hotel quickly became the hotel of choice for travelling business people, politicians and government officials and other well-heeled visitors to the area. Like most small-town hotels, the Queen’s fortunes declined following the Second World War. As tastes in travel accommodations changed, the hotel became known more as a downtown tavern with low-cost rental apartments. The hotel has also undergone a number of alterations over the years, a substantial one-storey addition has been added to the rear of the building and, as is often the case in buildings of this nature, the layout of the main floor has been dramatically altered. However, the hotel’s sandstone construction and overall style and design continue to communicate its historical significance as an early, business-class hotel and it continues to serve as an impressive visual anchor to Fort Macleod’s historic commercial district. More information on the Queen’s Hotel can be found on the Alberta Register of Historic Places. My great grandfather built the Queens Hotel ~ Colin Melville Genge. Thanks for the information, Jen. Information in our research files show that a Colin Genge built the first hotel to bear the name Queen’s. Mr. Genge attached two wood frame residences together. He sold this hotel to J. Hollies in 1889 who in turn sold it to Harry Stedman in 1896. Mr. Stedman had the present Queen’s Hotel built next to the original–hiring local contractor Thomas H. Scott to build it. The sandstone used was quarried near Head-Smashed-In Buffalo Jump. (A quarry owned, incidentally, by Colin Genge.) Once the current hotel was built, the original wood frame hotel was torn down.